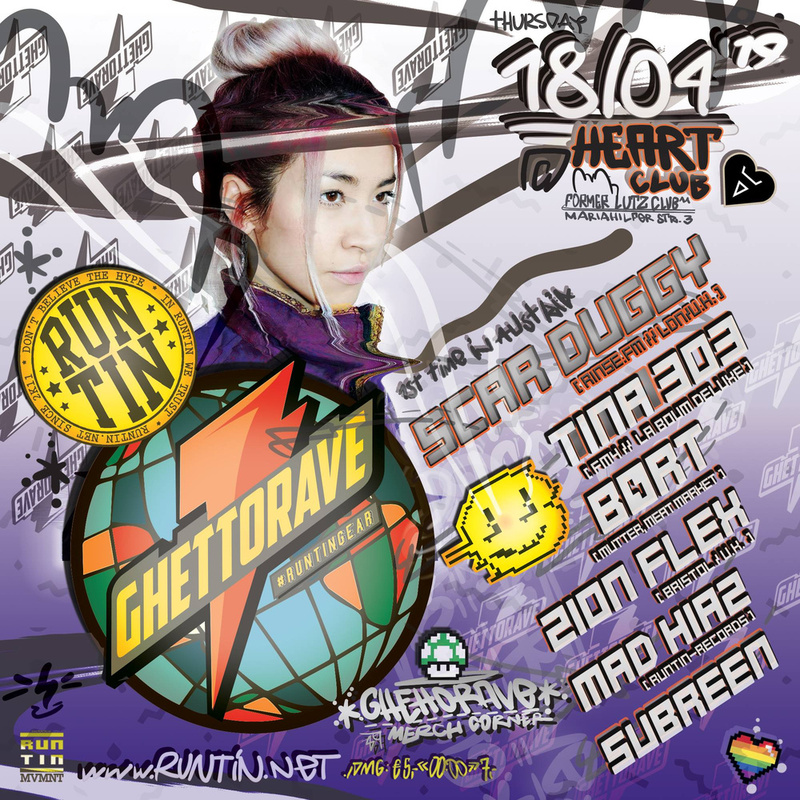 #GHETTORAVE is our #RUNTINjamz Electronic Dance event format where we tendencially focus on more marginalized genres and keep on drifting from Bassy Breaks over UK House to cheesy Garage - from morbid Detroit to ghetto Chicago - from Funky favelas to Kuduro townships - heartical Jungle and Acid Techno - Miami Bass and Rotterdam Hard. Basslines is our business and good vibes our concern! We are happy we’ve finally a new space at #HeartClub in the very heart of Vienna in which’ basement we’ve been allowed to install a vibesy, funky-filthy bassment atmosphere and party hard with all kinds of tribes and odds till the break-a-dawn! This time we’ve invited a special guest & friend from London - SCAR DUGGY - and are very happy to host her for the first time in Austria. Scarlet now plays internationally on the underground funky and bass scene, a true selector with a vast and varied pallet, spinning everything from world music to uk funky, uk bass, baile funk, dembow, club, break beat, footwork, grime and garage. Having first started DJing 8 years ago Scar is more than a well known name within the London club circuit, performing at almost every major venue, most recently headlining room three at Fabric. Scarlet comes from musical background and made her first radio appearance aged 15 hosting her own show on a local radio station. She then went on to do a weekly show on FLEX FM for two years and now makes regular appearances on stations such as RINSE FM, NTS, REPREZENT and RADAR as well as currently having two regular shows on female led station FOUNDATION FM and Nettle Radio and frequent guest mixes and take overs on the Marcus Nasty Show on Rinse FM. When she’s not laying down tunes on radio or at functions you can find her shelling down festivals such as Secret Garden Party, Boomtown, Shambala and Horizon and making international ground across Europe in countries such as Italy, Croatia and Bulgaria since 2014. She now has 2019 bookings so far confirmed in Berlin, Florence and Tel aviv. Circa afterhours, "each and every saturday morning"